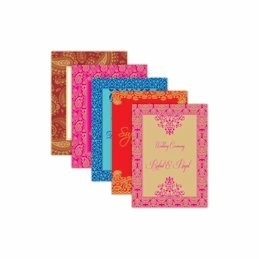 Celebrate the auspicious occasion of your wedding with our huge assortment of captivating wedding cards, scroll invitations and wedding accessories. 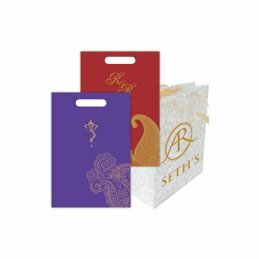 To create truly remarkable wedding cards that reflect the aspirations of our clients, we work diligently with them to lend a high degree of customisation and character to the wedding cards. 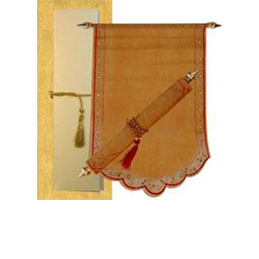 There are variety of materials (silk, velvet, paper, wool, etc.) and printing options to choose from. 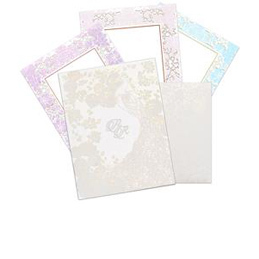 You can also experiment with the different types of finishes to add a unique flair to your wedding card. 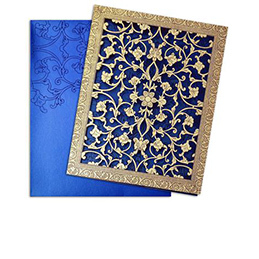 At Universal Wedding Cards, you'll find a wide range of wedding cards like Hindu Cards, Christian Wedding Invitations, Muslim Shaadi Cards and many others. 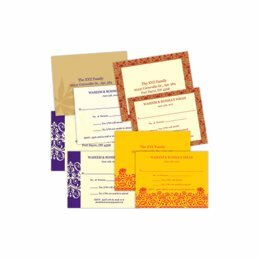 In addition to these cards, we also have several add on items such as Thank You cards, RSVP cards, programme booklets, place cards, menu cards, and save the date cards. 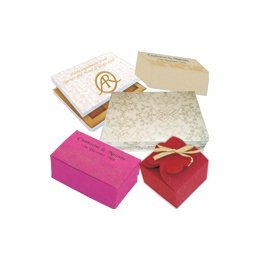 Usually, Wedding Cards are accompanied with gifts and you can make a lasting impression on the recipients by using riveting wedding accessories for these gifts such as our exclusive carry bags and cake boxes (or gift boxes). 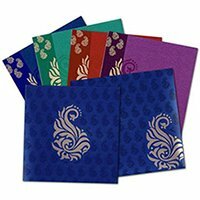 We also have other wedding accessories like wedding envelope seals, PVC sleeves, address stickers, money stuffing envelopes, tassels, hand-crafted Ganesh favors, jewelled kundans, and wedding scrolls. Our scroll invitations for Indian weddings are quite popular, especially, with those who are looking for a rustic, vintage themed indian wedding. 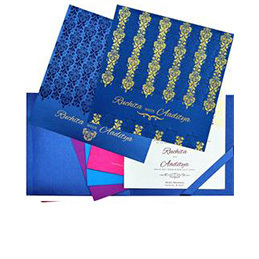 Apart from weddings, these scroll invitations, indian wedding cards, indian wedding invitations could also be used for engagements, bar & bat Mitzvah, parties, anniversaries, bridal shower, birthdays, and house-warming parties. 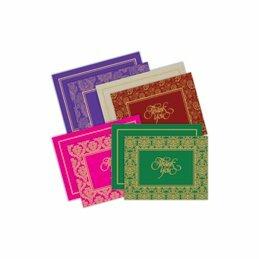 Our experience of more than four decades with indian wedding cards & wedding invitations has been instrumental in understanding and delivering on the expectations of our clients. From the quality & design of our wedding cards to the quick turnaround times, we ensure that every part of the process runs smoothly as intended. We'll be delightful to be a part of your wedding celebrations. For any enquiries related to price, quantity, printing, or delivery options, please feel free to contact us, we are available to provide best quality printing for wedding cards & scroll invitations. 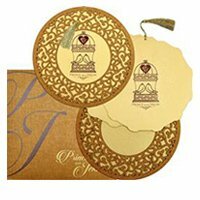 Please browse our website to view wedding invitation cards, Sikh wedding invitations, Islamic wedding cards, and Punjabi wedding cards. 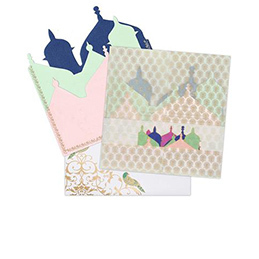 The wedding card designs you select reflect the style and type of event you are hosting. 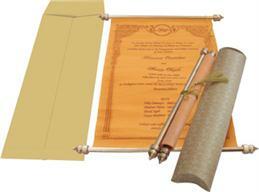 You will find exquisite invitation cards to get your celebration off to the perfect start at Universal Wedding Cards.